As you study the Gospel of Mark, you will be reading one of the most powerful surviving testimonies of the ministry, death, and Resurrection of Jesus Christ. Mark relates events in a fast-moving, dramatic account that focuses more on the powerful deeds of the Savior than on His teachings. Foremost among those deeds was the Atonement, which Mark emphasized was central to Jesus’s mission as the Christ﻿—the long-promised Messiah. As you study Mark’s account of how the Savior fulfilled His atoning mission, you can find courage to take up your cross and follow Him, as He asked His disciples to do. According to early Christian sources, Mark was not among the original disciples of Jesus Christ, but he later converted, became an assistant to the Apostle Peter, and wrote his Gospel based on what he learned from Peter (see Eusebius, Ecclesiastical History, trans. Kirsopp Lake, Loeb Classical Library, no. 153 , 297). If Matthew and Luke used Mark as a source when writing their Gospels, as some scholars postulate, then Mark’s association with Peter may help explain why Matthew and Luke would use Mark as a source. Mark (also called John Mark) and his mother, Mary, lived in Jerusalem; their home was a gathering place for some of the earliest Christians (see Acts 12:12). Mark left Jerusalem to help Barnabas and Saul (Paul) on their first missionary journey to the Gentiles (see Acts 12:25; 13:5). But for reasons that are not stated, he left before the mission was completed and returned home to Jerusalem (see Acts 13:13). This became a source of contention between Paul and Barnabas when they prepared to leave on a second missionary journey (see the commentary for Acts 15:30–40). Mark and Paul evidently reconciled, for Paul later wrote that Mark was with him in Rome (see Colossians 4:10; Philemon 1:24) and praised Mark as a companion who was “profitable to [him] for the ministry” (2 Timothy 4:11). Peter referred to him as “Marcus my son,” suggesting the closeness of their relationship (1 Peter 5:13). When and where was Mark written? Early Christian sources state that Mark wrote his Gospel in Rome, perhaps shortly after the Apostle Peter suffered martyrdom in about A.D. 64. Most scholars today believe that the Gospel of Mark was written between A.D. 66 and A.D. 73. To whom was Mark written and why? The Gospel of Mark contains textual details﻿—such as translated Aramaic quotations, Latin expressions, and explanations of Jewish customs﻿—that seem intended for an audience made up primarily of Romans and people from other Gentile nations, as well as those who were converted to Christianity, most likely in Rome and throughout the Roman Empire. Many believe Mark may have been with Peter in Rome during a period marked by severe trials of faith to many members of the Church. This period began in A.D. 64 when a terrible fire in Rome destroyed more than half the city, and rumors circulated that the emperor Nero was to blame for setting the fire. The Roman historian Tacitus recorded that to fight the rumor, “Nero substituted as culprits, and punished with the utmost refinements of cruelty, a class of men, loathed for their vices, whom the crowd styled Christians. … Vast numbers were convicted, not so much on the count of arson as for hatred of the human race. And derision accompanied their end: they were covered with wild beasts’ skins and torn to death by dogs; or they were fastened on crosses, and, when daylight failed were burned to serve as lamps by night” (Tacitus, Annals, trans. John Jackson, Loeb Classical Library, no. 322 , 283, 285). The Apostles Peter and Paul are said to have been among the Christians killed during the time of Nero. The years that followed were tumultuous ones for Christians in many locations throughout the Roman Empire. They suffered intense persecution, grief at the loss of beloved Apostles and fellow Saints, and the hardships of social and economic upheaval. Mark seems to have recorded teachings about Jesus Christ that would help readers in these circumstances. His narrative emphasized that the Son of God Himself had faced persecution throughout His ministry and had repeatedly taught that suffering and death would precede His Resurrection. One-third of Mark’s Gospel deals with the Savior’s teachings during the last week of His life. Mark bore witness that the suffering Son of God was ultimately vindicated﻿—Jesus did in fact rise from the dead. This testimony meant that the Savior’s followers need not fear; when they faced persecution, trials of faith, or even death, they were following their Master. They could endure with confidence that the Lord would help them and that all His promises would ultimately be fulfilled. What are some distinctive features of Mark? Mark’s narrative begins suddenly and dramatically and maintains a brisk pace, recounting events in quick succession. Mark frequently used the words straightway, immediately, and anon (at once), giving the effect of rapid pace and action. Even though over 90 percent of the material in Mark is also found in Matthew and Luke, Mark’s account often includes additional details that help us more fully appreciate the Savior’s compassion and the responses of people around Him (compare Mark 9:14–27 with Matthew 17:14–18). Mark is the only Gospel that relates the parable of the seed growing by itself (see Mark 4:26–27), the healing of a deaf person in the Decapolis region (see Mark 7:31–37), and the gradual healing of a blind man at Bethsaida (see Mark 8:22–26). Mark, more than the other Gospel writers, recorded the disciples’ shortcomings (see Mark 4:36–41; 6:52; 8:14–21). The disciples’ weaknesses stand in contrast to their great faith and successes, which are depicted in the book of Acts, helping us appreciate the transformation brought about by the Resurrection and the outpouring of the Holy Ghost. Among the important themes in Mark are the question of who Jesus was and who understood His identity, the Messiah’s role as a suffering servant, and the disciple’s role as one who must “take up his cross, and follow [Jesus]” (Mark 8:34). When Jesus was baptized by John the Baptist, the voice of God declared that Jesus was His Beloved Son. With authority, Jesus began preaching, calling disciples, and working miracles. As opposition to Him increased, He taught in parables. The Savior continued to work many miracles, demonstrating His compassion for others. Opposition to Him increased after Herod Antipas killed John the Baptist. Jesus taught against false traditions. Jesus Christ continued to work miracles. Peter testified that Jesus was the Christ. The Savior prophesied three times of His suffering, death, and Resurrection, but His disciples did not yet fully understand His impending Atonement. He taught them about the humility and service required of His disciples. Mark recorded the last week of Jesus Christ’s life, including His final teachings, suffering, death, and Resurrection. Mark 1–4 begins and ends by calling special attention to the identity of Jesus Christ. Mark 1:1 reads almost like a title to the Gospel of Mark: “The beginning of the gospel of Jesus Christ, the Son of God.” Mark 4:41 records the awestruck disciples’ exclamation after the Savior had calmed a storm at sea: “What manner of man is this?” Remembering these verses as you study Mark 1–4 can help you focus on Mark’s testimony concerning what manner of man Jesus Christ was. These chapters will, as Mark 1:1 suggests, begin to present the gospel (literally, the “good news”) of Jesus Christ, repeatedly testifying that He is the all-powerful Son of God (see Mark 1:11, 22, 24, 27, 34; 2:10, 28; 3:11, 22–27; 4:35–41). These chapters also show that people responded to the Savior’s work in a variety of ways. Both Jesus Christ and John the Baptist preached repentance and forgiveness (see Mark 1:4, 14–15; 2:17). Many people were “astonished” and “amazed” by the Savior’s teachings and miracles, and they gathered around Him (see Mark 1:22, 27, 33, 45). Others, however, failed to understand who He was and increasingly opposed Him (see Mark 2:1–3:7). Even the Savior’s disciples had to grow in their faith and understanding of who He was (see Mark 4:40–41). Mark 1:2–11. Why Did Mark Begin His Gospel with the Baptism of Jesus Christ? As recorded in Acts 10:37–40, Peter’s message to Cornelius and his household followed the same general outline found in the Gospel of Mark﻿—Jesus was baptized, the Holy Ghost came upon Him, the power of God was with Him, He traveled about doing good and healing people, He was crucified in Jerusalem, and on the third day He rose from the dead. 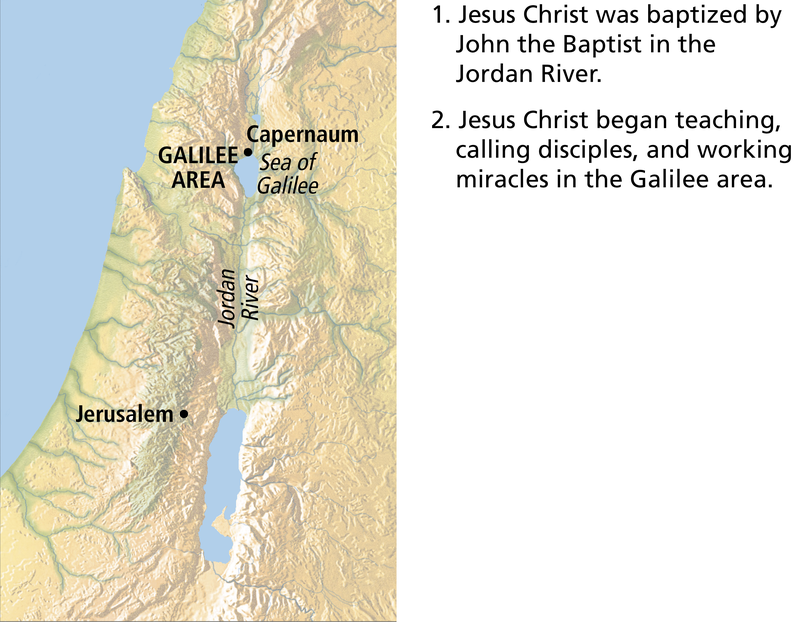 Evidently for Peter and Mark, the baptism of Jesus Christ marked the important starting point in the Savior’s public ministry (see Acts 1:21–22). To Fulfill All Righteousness, by Liz Lemon Swindle. “There came a voice from heaven, saying, Thou art my beloved Son” (Mark 1:11). It was at the baptism of Jesus Christ that the voice of God the Father declared to Jesus, “Thou art my beloved Son, in whom I am well pleased” (Mark 1:11). President Gordon B. Hinckley (1910–2008) pointed out the importance of the Father’s testimony: “[The Savior’s] ministry began with His baptism in the river Jordan at the hands of His cousin John. When He arose from the water, the Holy Ghost descended upon Him in the form of a dove, and His Father’s voice was heard [see Mark 1:11]. … That declaration became the affirmation of His divinity” (“He Is Not Here, but Is Risen,” Ensign, May 1999, 71). Since Mark’s stated purpose was to testify of “Jesus Christ, the Son of God” (Mark 1:1; italics added), it is fitting that Mark’s opening chapter records the voice of God the Father affirming that Jesus Christ is His Son. The essence of John the Baptist’s teaching and Mark’s first recorded words of Jesus Christ’s preaching both centered on the doctrines of repentance and forgiveness (see Mark 1:4–5, 15; 2:5–12, 17). This focus helps us understand the importance of this doctrine in the Savior’s earthly ministry and in our individual lives. “Repentance is one of the first principles of the gospel (see Articles of Faith 1:4). It is essential to your happiness in this life and throughout eternity. Repentance is much more than just acknowledging wrongdoings. It is a change of mind and heart that gives you a fresh view about God, about yourself, and about the world. It includes turning away from sin and turning to God for forgiveness” ( True to the Faith: A Gospel Reference , 132). “Thus, when Jesus said ‘repent,’ He asked us to change﻿—to change our mind, knowledge, and spirit” (“Repentance and Conversion,” Ensign or Liahona, May 2007, 103). What actions did the people in these verses take to receive a remission of their sins? Why are these actions essential to the process of receiving a remission of sins? Mark 3:31–35. Who are the Lord’s brethren? Scribes were considered experts in the legal aspects of the law of Moses. When preaching and interpreting the law, they typically added greater weight and authority to their teaching by appealing to former authorities and experts. In contrast, Jesus spoke with the authority of the Lawgiver, for He was the giver of the law of Moses. “However much it may run counter to the carnal mind to read of men possessed of devils, and of other men who cast them out, such is one of the realities of mortal life. One-third of the hosts of heaven﻿—all spirit children of our Eternal Father who is God﻿—were cast out of heaven for rebellion. As angels of the devil and as sons of him who is Perdition, they stalk the earth, seeking whom they may destroy. Their condemnation: they are denied bodies; for them there is no further progression; they are miserable and seek the misery of all mankind; they are damned souls, without hope, forever. If, as, and when﻿—subject to the restrictions and laws of our gracious God﻿—they can gain temporary tenancy in a tenement of clay, they take up their habitation in the bodies of others. “We do not know how or under what circumstances such tenancy is permitted. That all things are governed and controlled by law, we do know. … We do know from the Messianic utterance﻿—‘And he shall cast out devils, or the evil spirits which dwell in the hearts of men’ (Mosiah 3:6)﻿—that Jesus was destined, as he did, to cast out devils, and that this power was given to his apostles and seventies and, of course, is in the true church today” ( The Mortal Messiah: From Bethlehem to Calvary, 4 vols. [1979–81], 2:36–37). When studying accounts of the Savior casting out evil spirits, it is important to remember that Satan can have no power over people without their consent. President James E. Faust (1920–2007) of the First Presidency explained: “We need not become paralyzed with fear of Satan’s power. He can have no power over us unless we permit it. He is really a coward, and if we stand firm, he will retreat. The Apostle James counseled: ‘Submit yourselves therefore to God. Resist the devil, and he will flee from you’ (James 4:7). He cannot know our thoughts unless we speak them. And Nephi states that ‘he hath no power over the hearts’ of people who are righteous (see 1 Nephi 22:26)” (“The Great Imitator,” Ensign, Nov. 1987, 35). Many verses in Mark 1–4 recount the enormous popularity and enthusiastic reception the Savior experienced early in His Galilean ministry. For insights into how the popular response to Jesus Christ became a factor in His ministry, see the commentary for Mark 8:30. In the Bible “leprosy” refers to a variety of skin ailments, including Hansen’s disease, which is the illness often called leprosy in our day. Leprosy is a chronic disease that attacks skin, nerves, eyes, bones, and limbs. Left untreated, it progressively disables its victims before subjecting them to a painful death. Lepers in ancient Israel were quarantined, were commanded to call out “Unclean!” to warn anyone approaching them, and were considered to spread their uncleanness to anyone who came in contact with them (see Leviticus 13:45–46). It is therefore remarkable that Jesus touched this leper while healing him (see Mark 1:41). That act may refer to the laying on of hands, but it also reflects the Savior’s compassion and perhaps also His priority on mercy as one of the “weightier matters of the law” that supersedes ceremonial requirements (Matthew 23:23). After healing the man, the Savior commanded him to obey the Mosaic commandment that healed lepers present themselves to a priest, offer sacrifice, and undergo a purification ritual (see Mark 1:44; Leviticus 14:1–32). Leprosy was considered a living death because it destroyed the physical body as well as the person’s social standing, leaving the victim isolated and alone. By healing this leper, the Savior not only healed his physical body but also restored him to society. Be Thou Clean, by Kyle Vincent. “There came a leper … saying unto him, If thou wilt, thou canst make me clean” (Mark 1:40). Would warn of lepers near. They, too, would lepers be. And what His life would mean. This was not why He came. From death, from sin, from shame. A pure one must atone. And live by every word. Opposition to the Savior is one of the themes in the Gospel of Mark. Mark 2–3 presents Mark’s account of the beginning of opposition to the Savior’s ministry. Mark records that the Savior healed and forgave the man with palsy, called Matthew to the ministry, ate with sinners, and healed a man with a withered hand on the Sabbath. The scribes and Pharisees opposed each event, increasing their opposition from skeptical thoughts (see Mark 2:6–7) to plotting to destroy Jesus (see Mark 3:6). We gain a greater appreciation of the faith and determination of the man who was “sick of the palsy” and his friends (Mark 2:3) when we consider what would have been involved in their gaining access to the Savior. (The word palsy in this context means “paralysis,” so the man could not walk to the Savior but had to be carried.) First-century houses in Capernaum were constructed of stone walls that were topped by a flat roof made from wooden beams, thatch, and packed earth. The four persons carrying the paralytic on a stretcher found that the house where Jesus was teaching was too crowded to enter by the door. They gained access for their friend by climbing up to the roof, tearing a large opening through the mud-and-thatch construction (or perhaps through a palm-leaf-covered awning), and lowering the stretcher down to where the Savior was. The statement that “Jesus saw their faith” (Mark 2:5; italics added) refers to the combined faith of all five, as demonstrated by their unusual persistence and united effort in striving to reach the Savior. “Some years ago in our meetinghouse in Darmstadt, Germany, a group of brethren was asked to move a grand piano from the chapel to the adjoining cultural hall, where it was needed for a musical event. None were professional movers, and the task of getting that gravity-friendly instrument through the chapel and into the cultural hall seemed nearly impossible. Everybody knew that this task required not only physical strength but also careful coordination. There were plenty of ideas, but not one could keep the piano balanced correctly. They repositioned the brethren by strength, height, and age over and over again﻿—nothing worked. “It seemed too simple. Nevertheless, each lifted where he stood, and the piano rose from the ground and moved into the cultural hall as if on its own power. That was the answer to the challenge. They merely needed to stand close together and lift where they stood. “Although it may seem simple, lifting where we stand is a principle of power” (“Lift Where You Stand,” Ensign or Liahona, Nov. 2008, 53–54). Regarding the power that comes when individuals combine their faith, President Henry B. Eyring of the First Presidency taught: “Adding together the prayers and faith of many draws down the influence of the Spirit” (“To Know and to Love God” [evening with President Henry B. Eyring, Feb. 26, 2010], 4). To help you visualize the scriptural account of the man with palsy, review the video segment “Jesus Forgives Sins and Heals a Man Stricken with Palsy” (2:57) from The Life of Jesus Christ Bible Videos, available on LDS.org. This segment covers Mark 2:1–12. As described in these verses, what two miracles did the Savior do for the man? Which miracle could people see, and which could they not see? According to these verses, how could people know that Jesus had performed the unseen miracle? “This event in the life of our Lord was visible and irrefutable proof that he was the Messiah; and it was so recognized by those among whom he ministered. He had borne frequent verbal testimony that God was his Father and had supported that personal witness with an unparalleled ministry of preaching and healing. Now it was his purpose to announce that he had done what no one but God could do and to prove that he had done it by a further manifestation of his Father’s power. “Both Jesus and the ‘doctors of the law’ who were then present knew that none but God can forgive sins. Accordingly, as a pointed and dramatic witness that the power of God was resident in him, Jesus took (perhaps sought) this appropriate occasion to forgive sins. Being then called in question by the scripturalists who knew (and that rightly) that the false assumption of the power to forgive sins was blasphemy, Jesus did what no imposter could have done﻿—he proved his divine power by healing the forgiven man. To his query, ‘Does it require more power to forgive sins than to make the sick rise up and walk?’ there could be only one answer! They are as one; he that can do the one, can do the other” ( Doctrinal New Testament Commentary, 3 vols. [1965–73], 1:177–78). The Joseph Smith Translation makes clear that the crowd recognized that the man with palsy was healed by the power of God: “And immediately he arose, took up the bed, and went forth before them all; insomuch that they were all amazed, and many glorified God, saying, We never saw the power of God after this manner” (Joseph Smith Translation, Mark 2:9; compare Mark 2:12). In the ancient Near East, sharing a meal with others meant much more than simply eating and drinking together. It was a sign of fellowship; it indicated that a bond of friendship and peace existed or was at least being offered (see Genesis 31:43–54; Exodus 18:12; 2 Samuel 3:12–21). The Savior often used the occasion of sharing a meal to extend the invitation to repent and obtain forgiveness. On a number of these occasions, pious Jews criticized Jesus for dining in fellowship with people they regarded as sinners (see Mark 2:15–17; Luke 15:2; 19:1–10). Those regarded by the pious Jews as “sinners” could have included not only people guilty of breaking commandments but also people who did not live in accordance with the Pharisees’ traditions﻿—people whose daily work was considered unholy (like publicans) and people who were not Israelites (like Samaritans and Gentiles; see Acts 10:28). For more information about publicans, see the commentary for Matthew 9:9–13. Many of the objections Jewish leaders brought against the Savior during His mortal ministry concerned what activities were appropriate on the Sabbath day. In ancient Israel the Sabbath was regarded as something that set Israel apart from all other people. Other cultures had holy sites, sacrificial laws, and various religious customs, but only Israel had the Sabbath (see Exodus 31:12–17; Ezekiel 20:12, 20). To safeguard their holy day, Jewish rabbis developed many rules about what activities were or were not permissible on the Sabbath. Such traditions of the “oral law” were intended to prevent violations of the written law. By New Testament times, these traditions of forbidding certain activities on the Sabbath day had become points of contention among many Jews. An example of Jewish leaders objecting to the Savior’s Sabbath activities occurred when the Savior’s disciples picked some grain as they walked through a field with Him (see Mark 2:23–24). The law of Moses permitted a person walking through a field to pick some grain by hand as long as he did not take this privilege too far by using a sickle to harvest what was not his (see Deuteronomy 23:25). The Pharisees’ oral law, however, went further than the law of Moses and said that hand-picking grain on the Sabbath was forbidden. The Pharisees who saw the Savior’s disciples told Him that His followers had broken the law. The Joseph Smith Translation adds text immediately following Mark 2:27: “Wherefore the Sabbath was given unto man for a day of rest; and also that man should glorify God, and not that man should not eat; for the Son of man made the Sabbath day, therefore the Son of man is Lord also of the Sabbath” (Joseph Smith Translation, Mark 2:26–27 [in the Bible appendix]). For more information on the phrase “Son of man,” see the commentary for Matthew 8:20; 9:6; 10:23; 11:19; 12:8, 32, 40. “The Mosaic injunctions of Sabbath day observance contained many detailed do’s and don’ts. This may have been necessary to teach obedience to those who had been in captivity and had long been denied individual freedom of choice. Thereafter, these Mosaic instructions were carried to many unwarranted extremes which the Savior condemned. In that day the technicalities of Sabbath day observance outweighed the ‘weightier matters of the law’ (Matt. 23:23) such as faith, charity, and the gifts of the Spirit. “In our time God has recognized our intelligence by not requiring endless restrictions. Perhaps this was done with a hope that we would catch more of the spirit of Sabbath worship rather than the letter thereof. In our day, however, this pendulum of Sabbath day desecration has swung very far indeed. We stand in jeopardy of losing great blessings promised. After all, it is a test by which the Lord seeks to ‘prove you in all things’ (D&C 98:14) to see if your devotion is complete. “What is worthy or unworthy on the Sabbath day will have to be judged by each of us by trying to be honest with the Lord. On the Sabbath day we should do what we have to do and what we ought to do in an attitude of worshipfulness and then limit our other activities. I wish to testify unequivocally concerning the blessings of Sabbath day worship” (“The Lord’s Day,” Ensign, Nov. 1991, 35). In Mark 3:2, the Greek word translated “watched” implies that the Pharisees were scrutinizing Jesus with malicious intent. They had come to the synagogue not to worship, but to find fault. The Savior’s questions, “Is it lawful to do good on the sabbath days, or to do evil? to save life, or to kill?” set the stage for a vivid teaching moment (Mark 3:4–5). Some rabbis had determined that only in emergency situations was it permissible to save a life on the Sabbath. Of course, it would have been just as unlawful to murder on the Sabbath as on any other day. Yet ironically, after the Savior did good by healing the man’s hand, the very people who thought He was guilty of breaking the law﻿—and who imagined themselves the keepers of the law﻿—began on that Sabbath to plot how to destroy Jesus (see Mark 3:6). The Savior’s words help us understand that the Sabbath is a day for doing good. One way to “do good” on the Sabbath is to “go to the house of prayer and offer up thy sacraments … , and to pay thy devotions unto the Most High” (D&C 59:9–10). Other ways of doing good on the Sabbath “may include praying, meditating, studying the scriptures and the teachings of latter-day prophets, writing letters to family members and friends, reading wholesome material, visiting the sick and distressed, and attending other Church meetings” ( True to the Faith, 146). The Herodians were a political group with religious objectives. They supported the Herodian family and its leadership﻿—in particular Herod Antipas during Jesus’s ministry. They appear to have been in league with the Pharisees in opposing the Savior and attempting to entrap Him (see Matthew 22:15–16; Mark 3:6; 12:13). To what extent they were influenced by the Pharisees is not known. As part of their increasing attempts to oppose the Savior, the scribes and Pharisees accused Him of casting out devils by the power of the devil. As recorded in Mark 3:22–27, the Savior explained that a man who can overcome and bind a strong man must be even stronger than him. In this context, “the strong man” represented the devil, and Jesus was the one who could bind him (Mark 3:27). The fact that the Savior was casting out devils should have made it plain to His accusers that He had power over Satan (see Luke 11:22). Elder James E. Talmage (1862–1933) of the Quorum of the Twelve Apostles explained: “Christ had attacked the stronghold of Satan, had driven his evil spirits from the human tabernacles of which they had unwarrantably taken possession; how could Christ have done this had He not first subdued the ‘strong man,’ the master of devils, Satan himself?” ( Jesus the Christ, 3rd ed. , 268). For information on why Jesus Christ taught using parables, as well as insights on the parable of the sower (or soils) and the parable of the mustard seed, see the commentary for Matthew 13. This parable of the seed growing by itself, found only in the Gospel of Mark, teaches about the partnership between God and man. The man plants seeds in an environment where growth can occur, but then he must wait for that growth to happen (see Mark 4:26–27). As time passes, the earth that God created gradually brings “forth fruit of herself” (Mark 4:28). As Paul wrote, men may plant and water, but it is God who miraculously “giveth the increase” (1 Corinthians 3:6–7). Only God can make things grow. This principle applies to spiritual growth in individuals and to the growth of the Church throughout the world. While serving as an Area Seventy, Elder Wilfredo R. López discussed this parable and its application to our lives: “An important lesson of this parable is for those of us who are teachers, whether in the home or Church classroom, or who are involved in missionary work. The germination and full flowering of living gospel seeds in the hearts and minds of those we teach depend on factors over which we may have little control. The choice of whether a person will ponder and accept the truths of the gospel belongs, as a matter of personal agency, with those we teach. If a person’s testimony is to grow until it bears mature fruit, or conversion, God must be the primary force behind our harvest. Under the influence of the Holy Spirit, we may participate in the education of those who are growing and becoming fruitful. We, as authorized sowers, need to understand and trust that the restored gospel of Jesus Christ is a living seed and that if we will teach it, the grace of God will attend those we teach, as they grow to spiritual maturity and bring forth good works. Our joy will then be full in the day of the harvest” (“The Parable of the Seed Growing Secretly,” Ensign, Feb. 2003, 58). “But Jesus was not spared grief and pain and anguish and buffeting. … His ship was tossed most of his life, and, at least to mortal eyes, it crashed fatally on the rocky coast of Calvary. We are asked not to look on life with mortal eyes; with spiritual vision we know something quite different was happening upon the cross. “Peace was on the lips and in the heart of the Savior no matter how fiercely the tempest was raging. May it so be with us﻿—in our own hearts, in our own homes, in our nations of the world, and even in the buffetings faced from time to time by the Church. We should not expect to get through life individually or collectively without some opposition” (“Master, the Tempest Is Raging,” Ensign, Nov. 1984, 33, 35). Which of the events in these first chapters of Mark is most meaningful to you? Think about how the paralyzed man and his four friends combined their faith in a way that resulted in forgiveness and healing (see Mark 2:1–12). When have you seen the combined faith and prayers of people bring blessings from heaven? After studying these chapters, how would you answer this question about Jesus Christ: “What manner of man is this?” (Mark 4:41). Repentance can be defined as “turning away from sin” and “turning to the Lord.” As you study the accounts of the following individuals, list words and phrases from the verses that describe how each person turned to the Lord: Simon and Andrew (see Mark 1:16–18), the leper (see Mark 1:40–41), the paralytic (see Mark 2:1–5), and Levi (see Mark 2:14–15). Write about how these descriptive words and phrases can guide anyone who needs to repent. Why is it insufficient to turn away from sin without turning to the Lord? In your own repentance, how have you done both kinds of turning? As Jesus Christ began His ministry, His teachings and miracles helped many people recognize that He had come with divine authority (see Mark 1:22, 27). When has a teaching or miracle of the Savior brought you greater understanding of His divine authority? Share your answer with a friend or family member, or write it in your journal.